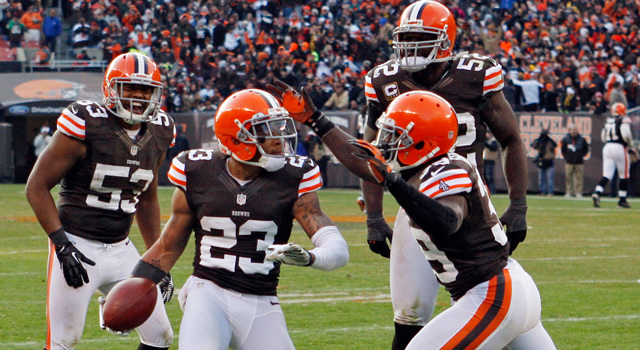 The Cleveland Browns have young talent, like CB Joe Haden (23), but haven't produced a winning season since 2007. Joe Banner's exploration process began almost immediately upon taking his new job in October. Handed the task of reviving the Cleveland Browns, a proud franchise mired in a historic tailspin, the CEO set out to learn. His modest goals were to find answers to these questions: Who are these people working in the organization I now run? And why do they do things the way they do them? Banner walked into the offices of department heads, management staff, secretaries -- everyone. Door to door. For example, the day before he spoke to NFL.com, Banner had spent five hours walking around the building asking questions and educating himself. He wants to know how the computer system works to make sure the Browns are up on the latest technology, if they are efficient, if they are ready to win. And he isn't making any real changes until he has answers. "I started with an organizational chart: Tell me exactly what you do and how you do it and why you do it that way," Banner explained. "You start to develop an understanding, and if you do that, you get a feel for who they are and how they think." Taking over a colossal rebuilding effort in a tradition-rich environment with fans starving for a reason to eat dog bones again, Banner's task is tall. All he's been charged with since leaving the Philadelphia Eagles is to turn around a franchise with the second-worst winning percentage since 1999, a team with just one playoff appearance and no postseason wins. They have a new, fired-up owner in Jimmy Haslam who is hoping to bring a college football-like atmosphere back to Cleveland, just like he enjoyed as a power broker at the University of Tennessee. The Browns have a relatively new coaching staff under Pat Shurmur, who has one of the NFL's youngest rosters to mold. There have been promising signs -- the win over the Pittsburgh Steelers last week, for instance -- but so much is unsettled. Some needs are pressing, like renegotiating a deal for radio rights next season. But mostly, the real choices for Banner will come after the team's last game against the Steelers on Dec. 30. "Then we need to be in position to make some decisions," Banner said. Banner's methods of examination will lay the foundation. They underscore what those who work for the Browns already know: Everything is in play. Shurmur's job. The post of general manager. Quarterback Brandon Weeden's long-term prospects. Everything. There's a reason long-time team employees are whispering to one another, wondering who's going to go. There's a reason coaches do the same. "We as coaches always feel like we're trying out," Shurmur said before his team played the Dallas Cowboys to the wire in Week 11. "You live with the idea that you have to produce or it's out of our hands. I don't feel any differently. I do think that if Randy Lerner was still the owner, I'd still be doing whatever I could to build a team." Shurmur wishes the team's record was better than 3-8 -- giving him seven total wins in nearly two seasons -- and he hopes wins like last week's will "snowball." His focus through this season is simple: "Just try to keep inspiring the players to keep working." One of those players is Weeden. The rookie first-round quarterback has 12 touchdowns and 13 picks. He has impressed with his arm, but the debate has raged over his propensity for interceptions. Still, he not only believes he's the one to lead this team out of the wilderness, but Weeden also loves being on the team right now, with other players early in their careers like running back Trent Richardson and receiver Josh Gordon. "It's not easy to play in this league right out of the box as a rookie," Weeden told NFL.com. "And we've got so many guys who are thrown into that fire to do that. I'm very optimistic that this is a good place, there's a lot of young parts that have a good chance to be very successful. It'd be a shame to break things up." There is special emphasis on the quarterback and determining whether Weeden is the guy. "I don't think anybody denies that the quarterback is the most important player on the team," Banner said. "That's a pretty important one to get right." When it comes to building a franchise, Banner has the perfect model to follow. He was in Philadelphia for 19 years, with 11 postseason appearances and six NFC East titles. By the end, as president, he had final say on hirings and firings. 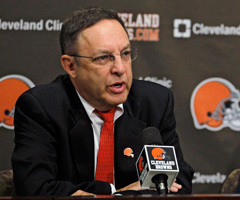 He has assumed day-to-day operations in Cleveland now, with former president Mike Holmgren gone and GM Tom Heckert unlikely to return for 2013. What Banner would like in his franchise is stability. A situation like coach Andy Reid had in Philadelphia, minus the past two seasons. Banner just needs to figure out whether it's Shurmur or a new coach. "Once you do (have stability)," Banner said, "that's a huge advantage over the rest of the league. But if you do it too prematurely, you'll not be as good as you need to be." What he's learned from Philly is to divorce himself from his bias. Don't imagine an offensive coach running one system or a defensive coach running another or a coach with whom you're friends. "You really just need to get somebody who's an outstanding leader who's going to put together a great staff and manage the staff well and be able to motivate the players to work hard and be unselfish," Banner said. The coach is one choice. Shurmur imagines a time when Cleveland is "going to erupt" with a consistent winner, and he's working to be the one to bring it to them. So is Weeden, who said he "absolutely" believes he's the franchise quarterback. Decisions. Choices. The future. Banner describes the experience in Cleveland as one that has him "stimulated and energized by the challenge." "It's just the 'How is the right way to build this' and 'What are we trying to get to?' " Banner said. " 'How do we put together the right combination of people to get us there?' That's what really excites me."